In the Philippines, it is customary to express width and thickness in inches while we use feet to express length. So a 2 x 3 x 10 means 2 inches thick by 3 inches wide and 10 feet long piece of lumber computed as (t x w x l)/12. 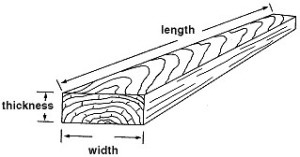 Example 1a: How many board feet is 2” x 3” x 10’ ? ( 2 x 3 x 10) / 12 = 60/12 = 5 bd. ft. Example 1b: How many board feet is 2” x 3” x 10’? 2 x 3 x 2 x 5= 5 bd. ft. Example 2: 2” x 6” x 8’ = 2” x 6” x 8’ = 8 bd. ft. Example 3: 2” x 5” x 12’ = 2” x 5” x 12’ = 10 bd. ft. Example 4: 1 ½” x 2” x 8 = 1 ½” x 2” x 4 x 2 = 2 bd. ft. Example 5: 1 ½” x 2” x 10 = 1 ½” x 2” x 2 x 5 = 5/2 bd. ft. Example 6: 2” x 2” x 10‘ = 2” x 2” x 10‘ = 10/3 = 3.33 bd. ft.
We can include the number of pieces in the calculations. Example 7: 3 pcs – 2” x 2” x 14’ = 3 pcs – 2” x 2” x 14’ = 14 bd. ft. Example 8. 4 pcs – 1 ½” x 2” x 10= 4 pcs – 1 ½” x 2” x 10 = 10 bd. ft.
With this method you won’t ever have to use a calculator in computing lumber. This entry was posted in MATH-Inic, MSC and tagged bd ft, board foot, computing board feet, lumber, lumber measurement on November 3, 2014 by Jose Adonis Duma.